The 2017 edition of the bpacnz antibiotics guide; "Antibiotics: choices for common infections", is now available online. There are several new features of this guide, along with some changes in advice. The release of the guide is also an opportunity to revise recommendations for prescribing in respiratory tract infections, including strategies for managing patient expectations. bpacnz is pleased to present the 2017 edition of “Antibiotics: choices for common infections”. The bpacnz antibiotic guide was first published in 2011 as a supplement to Best Practice Journal. A revised version of the printed booklet was published in 2013, with minor updates online. The Antibiotic Guide holds the record for our most popular resource – every month it is accessed online approximately 7000 times. The 2017 version is available electronically only; we know that many of you prefer the printed booklet form and have faithfully kept hold of dog-eared copies, but an online version allows us to make updates as necessary, given the rapidly changing landscape of antibiotic choices. We have included the option for individuals to print a copy from the most current online version, but we recommend that you regularly check the online version to see if any revisions have been made. The bpacnz Antibiotics Guide aims to give clear guidance on the antibiotic treatment of infections most frequently seen in primary care in New Zealand. This includes guidance on the clinical circumstances that indicate when an antibiotic is required, and the most appropriate choice, dose and duration of treatment. Since the Guide was first published, we have seen a trend towards shorter courses of antibiotics, more intensive dosing regimens and reserving use of broader spectrum antibiotics for very specific clinical scenarios. Choices of antibiotics change over time in response to growing antimicrobial resistance – this may be because the conventional choice is no longer effective due to high resistance levels or the need to preserve use of that antibiotic to ensure that it remains a viable option when needed. When azithromycin was first subsidised on the community Pharmaceutical Schedule, there was concern that unrestricted prescribing would result in increased resistance levels and a diminishing of its usefulness for treating conditions such as pertussis. Although not a prescribing requirement, azithromycin was initially recommended only for children for the treatment of pertussis, and erythromycin was recommended for use in adults. However, the 14 day regimen required for erythromycin, compared to the five day regimen for azithromycin, may result in adherence issues for some people. It is now the expert consensus that it is reasonable to prescribe azithromycin to both children and adults, for the benefit of ensuring that treatment is completed and reducing the risk of pertussis being transmitted to others. Erythromycin remains an alternative treatment, and trimethoprim + sulfamethoxazole may be used for those allergic to macrolides. Immunisation against pertussis remains the first-line of defence for protecting young infants who are not yet fully immune. Ensure that infants and children are vaccinated on time, encourage pregnant women to receive a subsidised booster vaccination and discuss vaccination with other family members who will have regular contact with an infant. Fusidic acid should not be in a prescribers “antibiotic arsenal”. Inappropriate use of topical antibiotics has played a major role in increasing rates of antibacterial resistance in Staphylococcus aureus. Fusidic acid once was recommended for treating impetigo, but this is now not considered to be best practice. In many cases, impetigo can be managed by simple skin hygiene measures alone. Topical antiseptics such as hydrogen peroxide or povidone-iodine can be applied to small areas of localised lesions (≤ three lesions) – if infection is any more extensive, and skin hygiene techniques have not worked, an oral antibiotic is appropriate. Flucloxacillin is the recommended first-line treatment for superficial skin infections that require antibiotic treatment, such as mild to moderate cellulitis, boils with complicating factors and extensive impetigo. Previously, trimethoprim + sulfamethoxazole was reserved as a second-line option for these infections if methicillin-resistant S. aureus (MRSA) was found to be present. However, expert opinion now is that trimethoprim + sulfamethoxazole is a useful second-line alternative to flucloxacillin if any atypical organisms are present (e.g. symptoms not resolving despite treatment with flucloxacillin or confirmed sensitivity after microbiological analysis) or if the patient is allergic to pencillins. Erythromycin also remains a second-line alternative to flucloxacillin. It was previously recommended to treat mild to moderate cellulitis with flucloxacillin for seven days. However, newer treatment guidelines recommend a shorter duration of antibiotic treatment, based on evidence of comparable cure rates. It is now recommended that cellulitis is treated with antibiotics for five days. 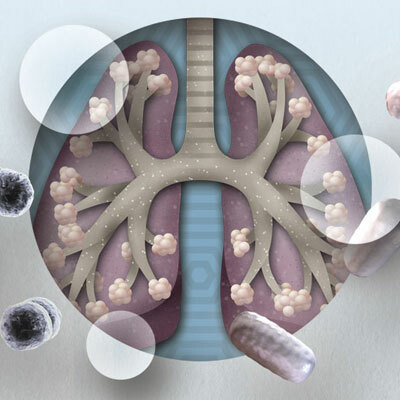 Prescribing antibiotics for respiratory tract infections: do you? Most respiratory tract infections are viral in origin and self-limiting and therefore do not require antibiotic treatment. However, it is estimated that more than half of antibiotics dispensed in the community are for respiratory tract infections. Antibiotic treatment is appropriate for patients with bacterial respiratory tract infections, such as community-acquired pneumonia, or for patients with a suspected bacterial infection for whom there is a high risk of complications or if the infection is not resolving. In practice, this is not always a straightforward decision. Many factors can influence a prescriber’s decision about whether or not to prescribe antibiotics. History and examination can provide clues to the probable cause of the patient’s symptoms but it is often difficult to distinguish clinically between viral and bacterial infections. If there is clinical uncertainty, many clinicians will err on the side of caution and prescribe, due to concern about potentially missing a diagnosis. In some cases, this may be a reasonable response, particularly if the risk of not doing so is high, e.g. non-specific respiratory symptoms and signs in a younger infant. Sometimes clinical guidance recommends that an antibiotic is appropriate when the diagnosis is only suspected, e.g. a child with a sore throat who has risk factors for rheumatic fever. Expectation and pressure from the patient may also factor into the decision of whether to prescribe an antibiotic. Other considerations include the timing of the consultation, e.g. can the patient seek treatment at night or in the weekend, and special circumstances, e.g. the patient is leaving town the next day. Previous negative experiences around prescribing that have affected either the clinician or the patient can also influence decisions. The key factor here is communication between the prescriber and patient, as to why the decision to prescribe, or not to prescribe, has been made. Providing a delayed, or “back pocket”, prescription, is a strategy that some prescribers use to overcome clinical uncertainty or address issues such as a Friday consultation or a patient who is unlikely to return if their symptoms deteriorate. A problem with this strategy is that it can undermine the conversation that has just taken place about why an antibiotic is not currently needed. If a delayed prescription is offered, it is important to ensure that the patient understands the circumstances under which it should be filled. To avoid the problem of patients filling delayed prescriptions immediately, some prescribers will make an arrangement with the patient that they can phone the practice nurse if their symptoms deteriorate or do not resolve, and a prescription is given at no further cost (or follow up arranged if necessary). Antibiotics are usually not necessary for patients with otitis media as most infections are self-limiting. The circumstances when antibiotics may be considered include: age under six months, age under two years with severe or bilateral infection, recurrent infections (≥ 3 in six months) or no improvement within 48 hours. Any patients with suspected pertussis should be given an antibiotic if it is within three weeks of onset of cough (or if the duration of cough is unknown). The antibiotic will not alter the course of illness, unless given within the first few days of infection, but it will reduce the risk of transmission to others. Prophylactic antibiotics are also recommended for any high risk contacts, e.g. infants, pregnant women. Clinical circumstances which might alter a “no antibiotic” prescribing strategy include: if the patient is systemically very unwell, the presence of co-morbidities such as significant respiratory or cardiovascular disease, immunosupression, young infants (especially if born prematurely) and frail elderly people. I have a couple of practical issues with flucloxcacilla: 1. In young children, trying to achieve a frequent-dose medication on an empty stomach is often impractical. 2. It is also difficult to arrange for midday doses at school/daycare. Is it pharmacologically possible to do once or twice day dosing in a similar way to the dosing for amoxil with strep throat?